I’ve seen other people make natural plant supports from clippings. But not being a very handy person, I hadn’t thought of actually trying it myself. However, I can now reveal – it is really easy. Even if you’re someone who can barely change a light bulb, then you can make natural plant supports out of birch, hazel or willow twigs. 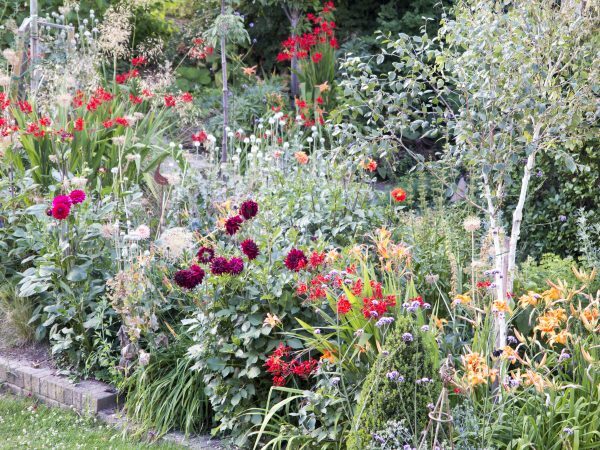 The border in summer – I have a selection of metal supports, but it does look cluttered until all the plants are in bloom. Natural plant supports seem to ‘disappear’ more. We recently had our silver birch tree pruned, so we had lots of wood clippings. And even if you don’t have a birch tree, there are lots of silver birch in most parts of Britain. They shed their twiggy branches regularly, so keep an eye out. I cut most of the clippings to approximately the length of a garden fork. 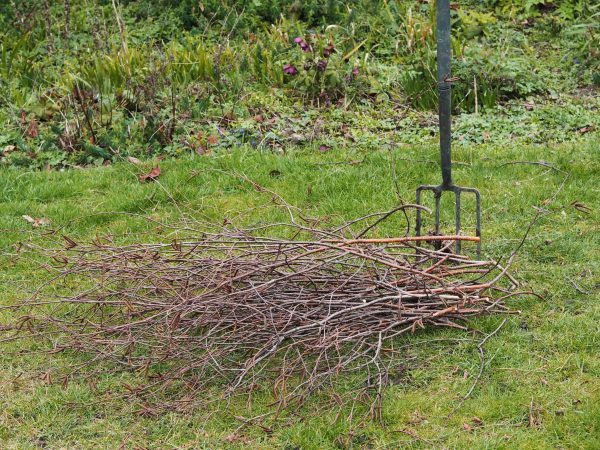 Choose – or cut – small branches that have at least 6″-9″ of fairly firm wood that you can jam into the soil. The rest of the birch cutting needs to be bendy and flexible. I cut a neat pile of silver birch clippings so I could make plant supports. When my back was turned, Mr Middlesize took them away to burn them. I got them back just in time…sense of humour failure all round. 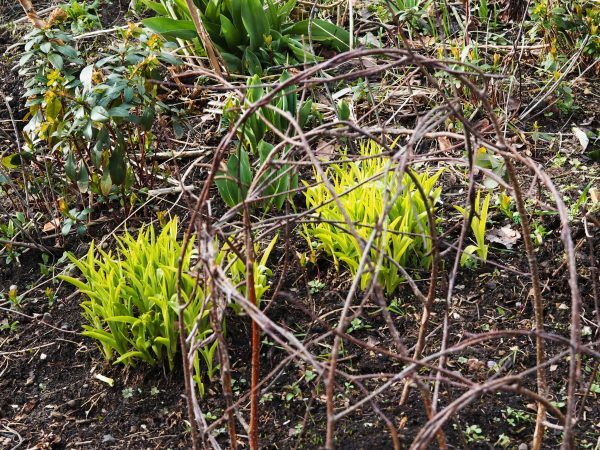 Most gardeners make their plant supports in late April or early May, when the perennials have begun to spring out of the ground. However, I know where my dahlias are because I protect them over winter with a pile of mulch, marked with a stick. Jam the sticks around the plant in a circle, wedging them firmly into the ground. Then bend some of the twigs over the top of the plant, weaving them together. 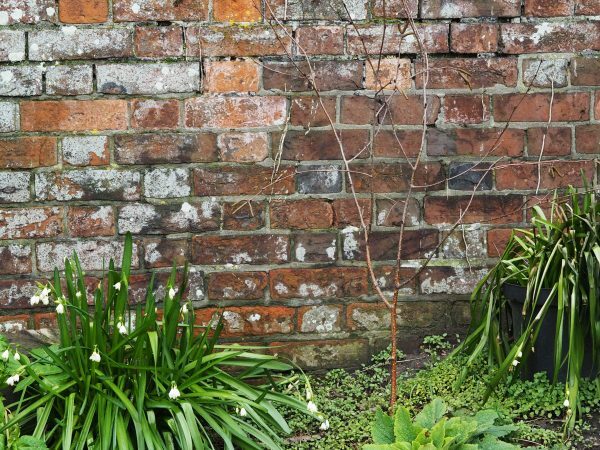 The starting position – around 6 silver birch clippings wedged into the soil in a circle around the plant. Then gently twist, poke and ease the twiggy ends around each other, fixing each branch by weaving it into the next one (or the opposite one when you’re going over the top). Wind, bend, ease, tease…until all the tendrils are wrapped around each other, locking it all into place. Carry on until you have a birch twig cage over where your plant will be. I added some extra twigs lower down as my first plant support cage looked a bit high. Plant supports should be about three quarters of the eventual height of the plant. These were literally the first natural plant supports I’d ever made. They’re not perfect, but they’ll do the job of supporting the plants, and I’ll get better at it. My first ever home-made natural plant support – and it only took about 20 minutes to do. I’ve always envied the well supported borders of professional gardens. Now I’m cautiously hopeful that there will be fewer flattened blooms in the Middlesized Garden next summer. I’ll report back, so do subscribe (enter your email address in the box top right). We publish every Sunday morning. 12 comments on "How to make natural plant supports from clippings"
This was a great idea and the instructions were so clear. 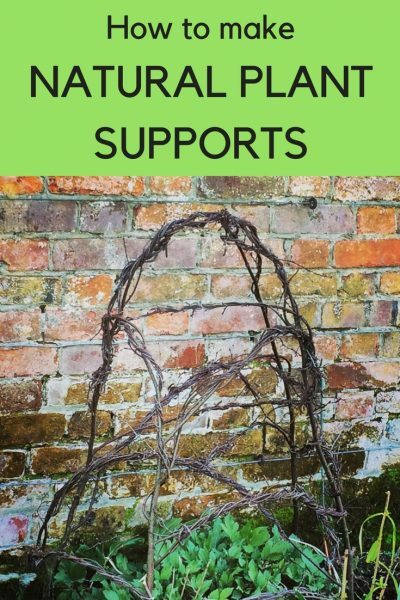 I have a river birch and a kiwi vine that I think will make wonderful materials to create such a beautiful and rustic support. Thank you again. Great and informative ideas. Really helpful for me as I’m a gardener. 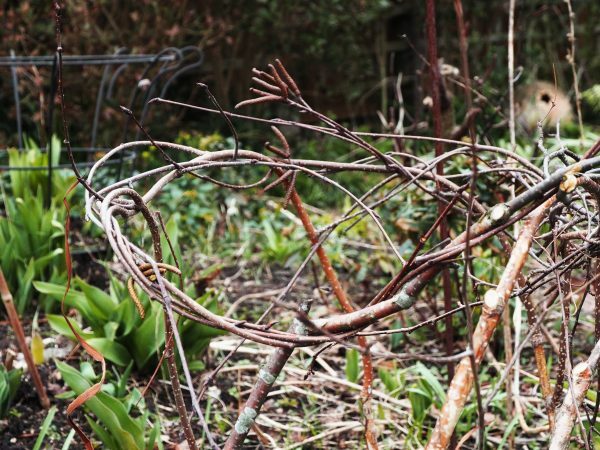 I love the near miss with the birch cuttings – and you make it look easy so I will definitely give it a try with the cornus stems when I cut them down soon. Only just found your blog and I think it looks very, very interesting!! 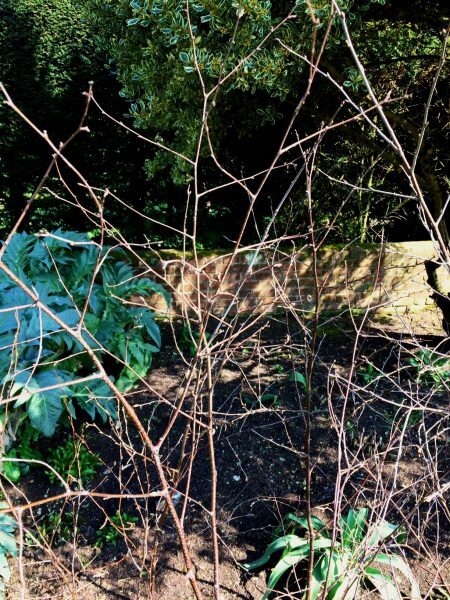 Love the birch twig ideas, especially as I have a silver birch and I’m about to buy and plant dahlias in a newly created bed …… I want it to look like your beautiful picture! Dahlias are a good plant for a splash so here’s hoping! We were aware that we were just on the margins of the sap being about to rise, therefore causing weeping, but we just got away with it, probably because of the Beast From the East. I think that really cold snap pretty much stopped everything in its tracks for a week or so. In an ideal world, I’d have done it before Christmas (and had more birch twigs for Christmas decorations). Thank you for your instructional video – so helpful. Just one thought though, you mention that you have just had your Birch tree pruned. I thought Birch trees were one of the few you had to prune mid-Summer to avoid the wounds weeping. Do you seal the wounds? My friends cut back one branch on their BirchTree a couple of years ago and it wept copiously , actually creating a puddle! Thankfully it did recover. I would be interested to hear your thoughts about this. Many thanks. We just about got our silver birch pruned before its sap started to rise for spring. Late summer or early autumn, as it’s just beginning dormancy, are really a better time to prune silver birch, because they do weep sap if it’s rising, which happens in spring. But January and February are just about OK, and weeping sap doesn’t harm the tree long-term. Recent research indicates it’s better not to paint the wounds, and just to allow the tree to heal. I have to admit to having pruned our silver birch once before at completely the wrong season – May, I think it was, and it didn’t weep, so I imagine individual trees differ. I like the idea of using wisteria in supports – beautifully bendy.